The first in a series of five billboards Galería will commission to explore issues of immigration, artist Neil Rivas' billboard combines his documentary photography from the largest pro-immigrant rights march in the U.S. to date, and its appropriation referencing the Occupy movement. 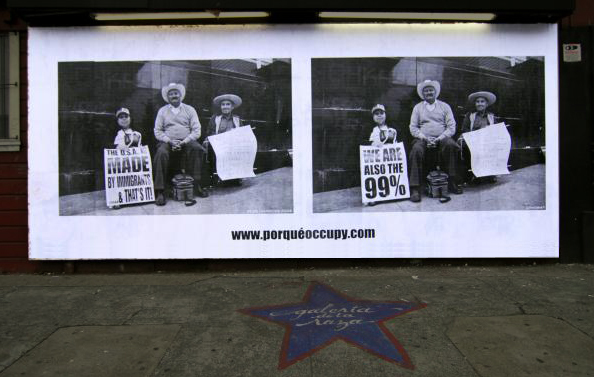 The billboard places the original 2006 photograph taken at La Gran Marcha next to an 'Occupy version' of it to draw parallels and prompt the question, "Can this image be a reality?". Furthermore, "¿Por Que Occupy?". The billboard is complemented by the website www.porqueoccupy.com, a project that serves as a strategy for Spanish speaking people to further open up discussion around the Occupy Movement. This billboard was produced in collaboration with ROOT DIVISION in conjunction with their exhibit, "MFA Now 2012" opening Saturday, February 11 at 7pm. The exhibition will run until February 25th.